This example constructs a Region Adjacency Graph (RAG) and progressively merges regions that are similar in color. Merging two adjacent regions produces a new region with all the pixels from the merged regions. Regions are merged until no highly similar region pairs remain. """Callback to handle merging nodes by recomputing mean color. The method expects that the mean color of `dst` is already computed. difference of the mean color between node `dst` and `n`. """Callback called before merging two nodes of a mean color distance graph. 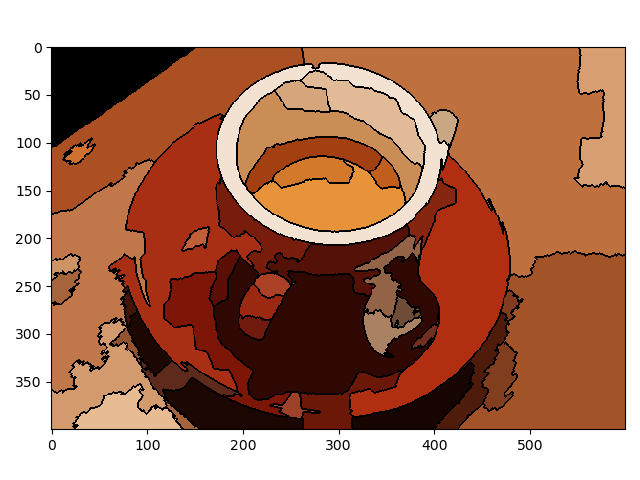 This method computes the mean color of `dst`.